Kell Brook will make the first defence of his IBF welterweight title against Romania's Jo Jo Dan at Sheffield's Motorpoint Arena on 28 March. It will be Brook's first fight since he was stabbed while on holiday in Tenerife last September. 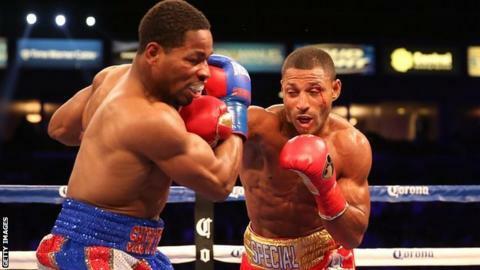 Brook, 28, won the world title last August with a points decision over Shawn Porter in the United States. Victory for Brook would pave the way for a fight against one of the division's marquee names this summer. British rival Amir Khan is a possible opponent, although Brook's promoter Eddie Hearn said he was keen to open talks with Mexican legend Juan Manuel Marquez. Hearn told BBC Sport: "A fight between Kell Brook and Amir Khan fills out any stadium in England and makes Khan more money than he could make from any other fight. "The whole of Britain wants that fight to happen, Sky wants it and there's a world title on the line. "Well, let's talk. Don't just tell the press what you want, tell me what you want and maybe we can make it happen this summer. It's frustrating." Khan is also top of Brook's wish list, although the fact Brook is one of three world champions in the welterweight division - Floyd Mayweather and Manny Pacquiao being the other two - means there are plenty of other options. "Me and Khan are both from Britain, there's a world title on the line, we're not the best of friends, it's a great fight," Brook told BBC Sport. "I want to put him to sleep and show everyone in the world that I'm number one. It's a fight that would capture the public's imagination and one I could really get up for. But if not him, no problem, there's other massive fights." "Kell won't wait around for Khan. Kell's a world champion, he can fight anyone he wants." Former world champion Khan has his heart set on a fight with unbeaten American great Mayweather, who owns the WBC and WBA welterweight belts. But with Mayweather in talks to fight WBO champion Pacquiao, and Puerto Rico's WBC middleweight champion Miguel Cotto waiting in the wings in case things go wrong, the Bolton fighter will probably have to wait a little bit longer. "Kell won't wait around for Khan," added Hearn. "Kell's a world champion, he can fight anyone he wants. "Marquez is in England next week and we'll be talking to him and his team. That fight at [Sheffield United's ground] Bramall Lane is immense, wonderful. "And if Kell beats someone of Marquez's calibre, he's got to be in with a shout of fighting Mayweather, or at least in a position to be calling him out." Marquez, 41, is a four-weight world champion who was defeated by Mayweather in 2009 and has fought Pacquiao four times - losing narrowly twice, drawing once and winning by knockout when they last met in 2012.